Leib Guards reception at the Constantine Palace. The Russian Imperial Guard, officially known as the Leib Guard (Russian: Лейб-гвардия leyb-gvardiya, from German Leib "Life"; cf. Life Guards / Bodyguard) were military units serving as personal guards of the Emperor of Russia. Peter the Great founded the first such units following the Prussian practice in the 1690s, to replace the politically motivated Streltsy. The Imperial Guard subsequently increased in size and diversity to become an elite corps of all branches within the Imperial Army rather than Household troops in direct attendance on the Tsar. Numerous links were however maintained with the Imperial family and the bulk of the regiments of the Imperial Guard were stationed in and around Saint Petersburg in peacetime. Plus the following were part of the 23rd Army Corps, Warsaw Military District. Headquarters, Warsaw, Poland. 3rd Guards Infantry Division. Headquarters, Warsaw. Every soldier and officer of the Guard had the style of the Leib Guard (Лейб-гвардии ...), for example: Colonel of the Leib Guard (Лейб-гвардии полковник). It is a misconception that the monarch himself functioned as the commander of the Leib Guard regiments, so only he and some members of the imperial family could hold a title of Colonel (Polkovnik) of the Guards, but in fact there were many guards officers in the rank of colonel. Commissioned officers enjoyed a two-grade elevation in the Table of Ranks over regular army officers; this later changed to a one-grade elevation -- first for the New Guards then for the rest of the Leib Guard. 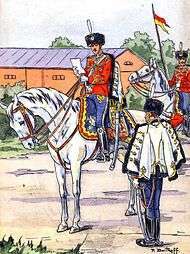 Following the abolition of the rank of Major in 1884, most grades below VII shifted one position upwards, effectively returning to those of the Old Guards. THE RUSSIAN ARMY, 1914 by Mark Conrad, 2001. Divisions.